If you’re tired of your usual morning shake or sugar-free Greek yogurt, then it’s time to switch it up with this delicious low-carb smoothie bowl. Full of flavor and texture, it’s almost like eating ice cream for breakfast. Except it checks out at just 5 net carbs per bowl. And it couldn’t be easier to make. 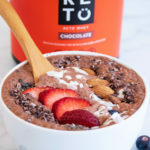 All you need to do is throw your chocolate smoothie into a bowl, add nutrient-dense ingredients like maca, chia, and cacao, and you’ve made yourself the perfect breakfast. The high protein content also makes it an excellent post-workout meal. Protein is an essential nutrient for muscle growth, and this delicious smoothie bowl has 35 grams of protein per serving. Protein is especially important if you’re looking to build or maintain muscle and shed pounds. Eating protein after resistance training, for instance, can increase muscle growth as compared to carbs alone[*]. Whey protein is particularly effective at helping you build lean muscle while losing fat. Grass-fed whey protein may also speed recovery and decrease muscle soreness[*]. Another potential performance-boosting ingredient in this smoothie bowl is maca — a healing root from Peru. Maca is known to help everything from hormone balance to exercise performance. When a group of male cyclists was given maca supplementation for 14 days, they not only completed the event is less time, but the maca also increased their libido — a common side effect of this Peruvian root[*]. Trying to lose weight doesn’t mean you have to say goodbye to delicious food. In fact, this smoothie bowl is an excellent option if you want to stay full and keep hunger cravings at bay. Protein may help you control your appetite and keep you feeling satisfied. That means fewer cravings to throw you off track — even if you’re in a calorie deficit[*]. In one randomized clinical study, researchers gave obese subjects on a restricted calorie diet a whey protein supplement for 12 weeks, then measured their weight loss and lean muscle mass as compared to a control group. The whey protein group not only lost a significant amount of weight, but they also retained more lean muscle mass[*]. Chia seeds are another weight-loss friendly ingredient in this smoothie bowl. Much like protein, chia seeds can help keep you feel full and reduce your overall food intake[*]. Research shows that chia seeds may improve weight loss and blood sugar control in people with type 2 diabetes. In one study, subjects who ate chia seeds for 6 months lost more abdominal weight, had a decrease in inflammation, and had better blood glucose control then the subjects in the control group[*]. Inflammation is at the root of many common diseases in the Western world. Heart disease, diabetes, cancer, and neurological diseases have all been linked to chronic inflammation[*][*][*]. Eating a diet rich in anti-inflammatory foods is one of the best ways you can get ahead of inflammation and work towards prevention. Chia seeds and cacao are two nutrient-dense ingredients that may help in the fight against inflammation. In one study, researchers gave type 2 diabetics either chia seeds or wheat bran to determine if chia seeds would affect risk factors for heart disease. After 12 weeks, the patients consuming chia seeds had lowered blood pressure and significantly decreased their inflammatory markers as compared to the wheat group[*]. Cacao contains an abundance of phytonutrients called polyphenols. Polyphenols play a number of roles in your body to protect you from disease, and regulating inflammatory pathways is one of them. Evidence suggests that cacao may even play a role in protecting you against heart disease through its anti-inflammatory properties[*]. Next time you’re craving an acai bowl, opt for this low-carb version that contains tons of protein and nourishing fats. You can add extra nuts, peanut butter, seeds, and berries — mix it up and make it your own! This chocolate whey almond smoothie bowl with chia seeds, almond milk, chocolate protein, and cocoa powder is the perfect breakfast — protein smoothie in a bowl. Add all smoothie ingredients to a high-speed blender. Blend on high until smooth. Add a handful of ice if desired. Pour smoothie into a large bowl and add toppings of choice. Macros/serving below does not include the optional toppings.